The placenta is a vital connecting organ between the maternal uterus and the fetus. It supports the developing fetus, in utero, by supplying nutrients, eliminating waste products of the fetus and enabling gas exchange via the maternal blood supply. In this article, we shall look at the development of the placenta. Fig 1 – The placenta supports the developing fetus in utero. The development of the placenta begins during implantation of the blastocyst. The 32-64 cell blastocyst contains two distinct differentiated embryonic cell types: the outer trophoblast cells and the inner cell mass. The trophoblast cells form the placenta. The inner cell mass forms the fetus and fetal membranes. On the 6th day, as the zona pellucida disintegrates, the blastocyst “hatches”, allowing for implantation to take place. The trophoblast cells interact with the endometrial decidual epithelia to enable the invasion into the maternal uterine cells. The embryo secretes proteases to allow deep invasion into the uterine stroma. Implantation is interstitial. Normal implantation occurs on the anterior or posterior wall of the body of the uterus. The most common ectopic implantation site is in the ampulla of the Fallopian tube. On the 8th day of development, the trophoblast cells differentiate into the outer multinucleated syncytiotrophoblast which erodes maternal tissues by sending out projections and the inner mononucleated cytotrophoblast which is actively proliferating. The syncytiotrophoblast is responsible for producing hormones such as the Human Chorionic Gonadotrophin (hCG) by the second week which is used in pregnancy testing. On day 9, lacunae or spaces form within the syncytiotrophoblast. The syncytiotrophoblast also erodes the maternal tissues allowing maternal blood from uterine spiral arteries to enter the lacunar network. Thus early uteroplacental circulation is established by the end of week 2. Meanwhile, the cytotrophoblast begins to form primary chorionic villi or finger-like projections which penetrate and expand into the surrounding syncytiotrophoblast. In the 3rd week, extraembryonic mesoderm grows into these villi forming a core of loose connective tissue, at which point these structures are called secondary chorionic villi. By the end of the third week, embryonic vessels begin to form in the embryonic mesoderm of the secondary chorionic villi making them tertiary chorionic villi. The cytotrophoblast cells from the tertiary villi grow towards the decidua basalis of the maternal uterus and spread across it to form a cytotrophoblastic shell. The villi that are connected to the decidua basalis through the cytotrophoblastic shell are known as anchoring villi. Villi growing outward within the intervillous space from the stem (anchoring) villi are called branching villi and provide surface area for exchange of metabolites between mother and fetus. Imagining the villi as tree-like projections can help visualise their structure. Maternal spiral arteries undergo remodelling to produce low resistance, high blood flow conditions in order to meet the demands of the fetus. Cytotrophoblast cells invade the maternal spiral arteries and replace maternal endothelium. They undergo an epithelial to endothelial differentiation. This increases the diameter and reduces the resistance of the vessels. Pre-eclampsia is a trophoblastic disorder related to failed or incomplete differentiation of cytotrophoblastic cells during the epithelial to endothelial transformation. In the first trimester (0-13 weeks), the surface of the chorionic villi is formed by the syncytiotrophoblast. These cells rest on a layer of cytotrophoblastic cells that in turn cover a core of vascular mesoderm. Therefore, the placental barrier is relatively thick. The surface area for exchange dramatically increases by full-term (27-40 weeks). The placental barrier is much thinner and the cytotrophoblast layer beneath the syncytiotrophoblast is lost. The placental barrier is not a true barrier as it allows many substances to pass between the maternal and fetal circulations. Unfortunately, this means various drugs (e.g. heroin, cocaine) and viruses (e.g. CMV, rubella, measles) can enter the foetal circulation. As the maternal blood in the intervillous spaces is separated from the foetal blood by chorionic derivatives, the human placenta is known as the haemochorial type. 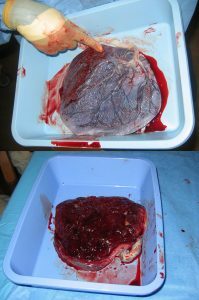 By the fourth month, the placenta has two components: the maternal portion i.e. the decidua basalis and the fetal portion i.e. the chorion frondosum. As the pregnancy advances, the chorion frondosum or the “bushy” chorion is formed as more villi develop on the embryonic pole. On the fetal surface, the placenta is covered by the chorionic plate; on the maternal side it is bordered by the decidua basalis of which the decidual plate is most intimately incorporated into the placenta. During the fourth and fifth months, the decidua form decidual septa which project into the intervillous space but do not join the chorionic plate. These septa have a core of maternal tissue but are covered by a layer of syncytial cells. At all times there is a syncytial layer that separates maternal blood in intervillous lakes from foetal tissue of the villi. The septa divide the placenta into compartments called cotyledons. Cotyledons receive their blood supply through 80-100 spiral arteries that pierce the decidual plate. Discoid in shape with a diameter of 15-25cm, approximately 3 cm thick and weighs about 500-600g. At birth, it is torn from the uterine wall and around 30 minutes after the birth of the child it is expelled from the uterine cavity. The maternal side will have 15-20 bulging areas which are the cotyledons, covered by a thin layer of decidua basalis. Intervillous lakes of the fully grown placenta contain approximately 150 mL of maternal blood, which is renewed 3-4 times per minute. The foetal surface is covered by it’s chorionic plate. 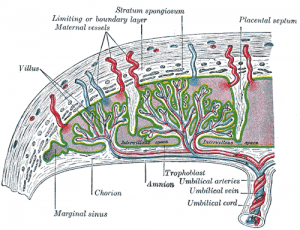 The chorionic vessels converge toward the umbilical cord. These are a number of large arteries and veins. The chorion is covered by a layer of amnion.The umbilical cord usually attaches in the middle of the placenta, perpendicular to it. A velamentous insertion may occur if the umbilical cord inserts outside of the placenta, but this is rare. Deposition of fibrinoid on the surface of the villi in the junctional zone and in the chorionic plate. Deposition of fibrinoid results in infarction of an intervillous lake or sometimes an entire cotyledon, which subsequently turns whitish in colour.